LiveCode LessonsGetting Started with LiveCodeGet Up and Running with LiveCode Legacy Android Prerequisites (pre 8.1.5)How do I Become an Android Developer on a PC? The most recent version of the Android SDK tools do not work with LiveCode. If you are using LiveCode 8.1.5 or later please install Android Studio as described in this lesson. This lesson describes the basic steps you need to follow in order to start up as an Android developer using a PC with Windows operating system. System configuration information and screen captures are provided. Android is another mobile device family supported by LiveCode. The steps discussed in this lesson outline a process that allows you to set yourself up as a LiveCode developer for the Android platform and successfully build and deploy test applications. The steps are set out in chronological order, first determining the software requirements and then setting up your system. Note: The screen captures are up to date at the time of writing this lesson. Note: It is assumed that you are familiar with the installation process of a Windows operating system and LiveCode. Please make sure these are installed before you commence with the remaining steps of this lesson. The following steps run you through the software installation process that you would typically follow on a PC. If you do not have the Java SDK (JDK) installed, then you can download it from: http://www.oracle.com/technetwork/java/javase/downloads/index.html. Navigate to the download link that is specific to your operating system and select the download link. Save the file to your file system, execute it and follow the installation steps that guide you through the installation. Note: You may get a warning dialog if you try to install Java SDK over a previously installed version. The dialog should allow you to reinstall the software, if you would like to do so. 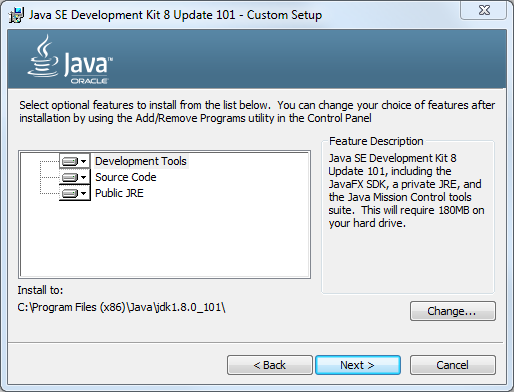 The Java SDK (JDK) installer lets you specify the path and the components you would like to install. LiveCode Android support does not require any configuration to the Java SDK (JDK) package or path selection and works with the default settings. You can continue the installation by selecting the Next > buttons that lead you through the installation wizard. Navigate to the SDK Tools only download link that is specific to your hardware platform. You will find this at the bottom of the page. Save the file to your file system. The current version of the SDK Tools is not compatible with LiveCode. Please download version 24.4.1. Unzip the downloaded zip file into a folder named "sdk". Then move the folder to the location you want to store your Android SDK. You will need to refer to the folder later so place it somewhere accessible. Inside the sdk/tools/lib folder you will find the files "AVD Manager.exe" and "SDK Manager.exe". Copy these files and place them in the sdk folder. LiveCode requires certain Android packages to be installed. 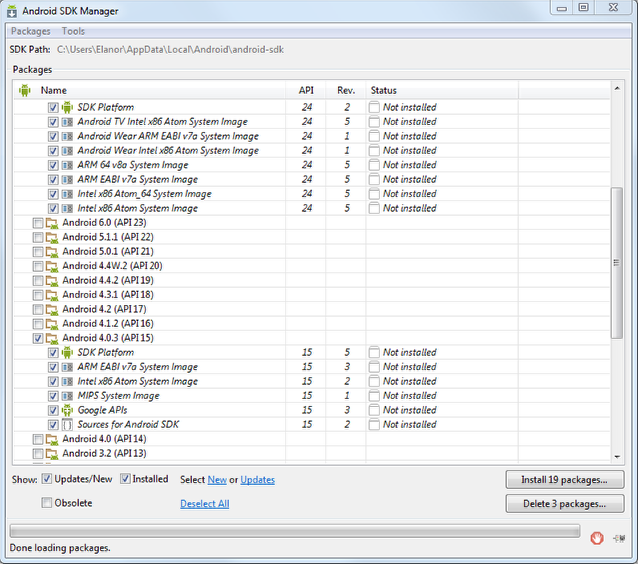 The Android SDK Manager lets you select the packages you would like to install in your Android development environment. Start "SDK Manager.exe" to install the required packages. By default, only a few packages are selected. From this version of the SDK I would recommend keeping the default selection. LiveCode requires the Android 4.0.3 (API 15) Package to be installed. Select Android 4.0.3 (API 15) in the list and click the Install button to install the package. Note: Very old versions of Android are not supported and the very latest versions of Android may not be supported until LiveCode has been updated. Once you have installed the required packages, you can use the Android AVD Manager to set up a virtual device that can be used in your development environment. This allows you to test your applications without requiring a physical Android device. You can launch the AVD manager from Start Menu of your Windows Manager. Make sure the Android AVD Manager is running. Choose the Name for your virtual device. Fill in the SD Card Size. Optionally enable Snapshot. This speeds up the launch of the emulator. You can launch the emulator by highlighting the virtual device you created and selecting Start... .
By now, you should have successfully installed the required software in you development environment. The next step is to launch LiveCode and configure it to interface with the Android SDK. This indicates that the path you specified is not pointing at the Android SDK root. You may have to navigate one level deeper into the folder hierarchy to access the root folder. The root folder may look something like: ...android-sdk-windows. Please go through the following steps carefully. 1.) Identify the correct zip file. The .zip that has just the command line tools is called "tools_r25.2.3.zip", and it contains *only* a folder called "tools". 2.) Extract this zip into a folder called "my_android_sdk". After extraction, you should see "my_android_sdk/tools" as the filepath. 3.) 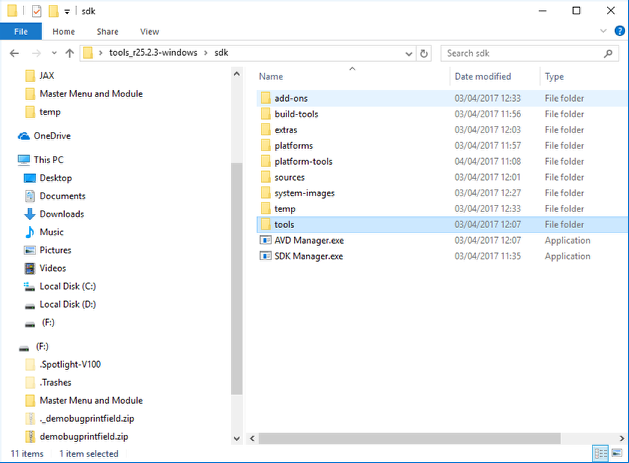 Go to "my_android_sdk/tools/lib" and copy the files "AVD Manager.exe" and "SDK Manager.exe", and paste them into the folder "my_android_sdk" NOT into tools. 4.) Double click on "my_android_sdk/SDK Manager.exe" to launch the sdk manager, and use sdk manager to download the "Android 4.0.3 (API 15)". 5.) 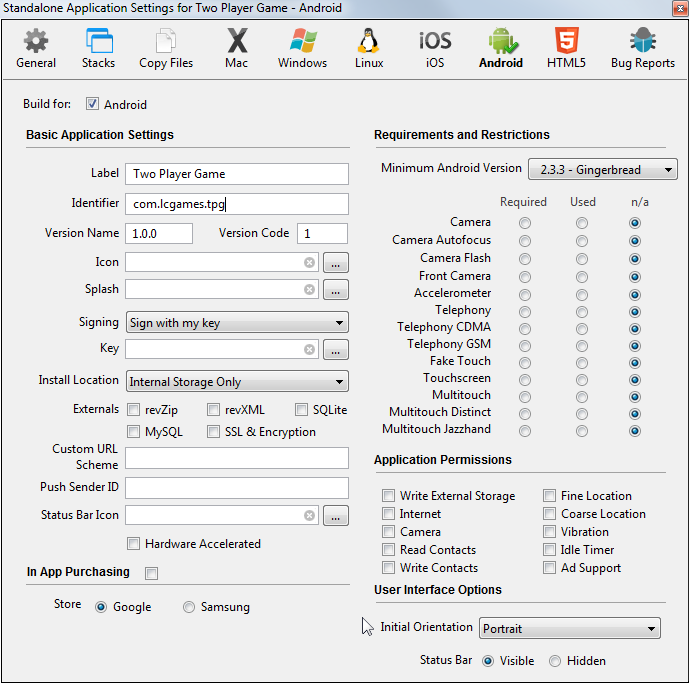 In the sdk manager, also check "Android SDK Platform-tools" and "Android SDK Build-tools". Those should appear at the top of the sdk manager window. 6.) Install all those packages. After all they are installed your "my_android_sdk" folder should include several new subfolders ("platforms", "platform-tools", "build-tools" and others). 7.) 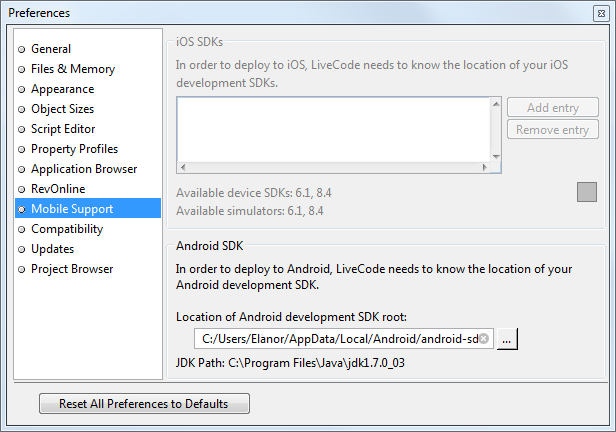 Open LiveCode, go to Preferences-> mobile support, and choose the "my_android_sdk" folder. 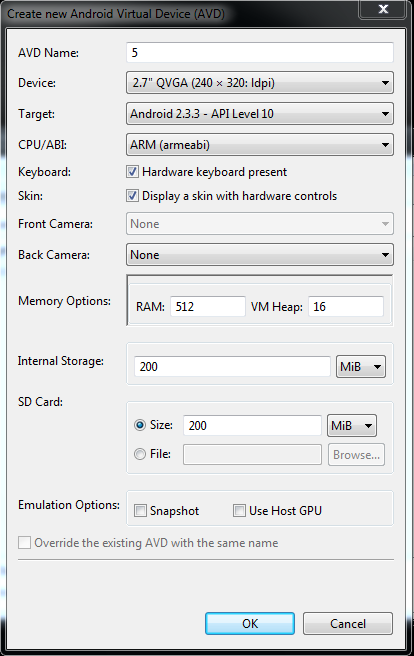 Select File -> Standalone Application Settings... from the LiveCode IDE. Then choose Android from the list of deployment options. This raises the Standalone Application Settings dialog for Android specific builds. You can make a stack build for Android by selecting the Build for Android tick box and configure any other options you wish to include. You can select the name of your application using the General option at the top of the pane and add files to your build by using the CopyFiles option at the top of the pane. Note: Making a stack build for Android disables building standalone mainstacks for any other non-mobile platforms. If you wish to share code and resources among platforms, factor your application into multiple stacks, using a different mainstack for mobile and desktop targets. Note: Inclusions, Copy Referenced Files, Bug Reports and Stacks features are not available when building for Android. Use the Copy Files feature if you wish to include multiple stack files in your application. Ensure the emulator is running or an adequately configured physical device is connected before trying to test your code. Then select a device from Development -> Test Target. The Test icon on the main pain of the LiveCode IDE should now be active and allow you to deploy your LiveCode application. Depending on how experienced you are with LiveCode, you may want to review more of the numerous lessons and tutorials we have on developing for Android, iOS and broader lessons that explore the general concepts behind LiveCode. The release notes accompanying LiveCode releases with Android platform support provide up to date development information and give you an overview of the features that you can access via LiveCode. Next: How do I Become an Android Developer on a Mac? I can't get my device to show up in "Test Target" Please help!! there could be a number of reasons for this and a bit more information would be quite useful, but I will make some assumptions here. I am assuming you are trying to user the Android Simulator. Try starting your simulator first and wait until the simulator shows an operational Android Interface which you can interact with, then start up LiveCode. You should now be able to select the Device from the "Development -> Test Target" menu. You have to have an actual project open. And the project has to be identified as an Android project. I spent an incredible amount of time sorting all this out last year. I´ve tried to connect to postgresql server from an android apk , and it didn´t return any message back, when I clicked the button. I´ve compiled for windows and it worked perfectly. Is it not fully functional to postgres access in the trial version for android 2.2 ? Or am I missing some point? I've noted that in the ' Externals' iten , in the ' Standalone application settings' page there is no option for postgres just for Mysql and SQLite. at the moment we do not have external PostgreSQL support on Android. We are looking into providing support for this in the future though. i cant get android sdk or avd to open. Ivdownloaded it multiple times and all the happens when i try to go into it to configure it all i get is a quick command prompt screen then it closes on me. As far as i know i have the right java to use it because it says it found it when i installed android sdk. Iv looked at various sites to try to figure it out but nothing seems to work. im using a PC with Win xp, if that matters at all. Im not that tech savvy and iv tried everything i could think up, am i missing something? the steps outlined in this lesson should lead you to the phase where you can set up and configure an Android Virtual Device. If you get to "Verifying the Android SDK and AVD Manager Package Installation", you should be able to start creating and configuring AVDs from the windows that are open. If you can do that, then the installation is probably working. I am wondering if you are possibly trying to start an AVD Manager from files that are part of a previous installation attempt. All I can suggest at this point is to remove your installation of the Android SDK and Java SDK and follow the steps in this lesson again. It is important to ensure that all the information here is followed, such as references to selecting certain tick boxes at some steps. this is really odd. The "windows" part of the path should not make any difference to the installation. Have you had a look at the Google support page or contacted them directly? The Android SDK part of your development environment is specific to the software that Google provides. Maybe this is an issue they are familiar with. Their current support page is: http://developer.android.com/support.html. In your post you downloades the Java 32 bit version. Is LiveCode limited to 32bit or could I use the 64 bit version? Any problem with the 1.7 version of the JDK? LiveCode will run on a 32 bit or 64 bit host operating systems. The JDK you use should match the host operating system you have installed, which may be a 64 bit version. The reason we show the use of a 32 bit version here is because we were running our demo on a 32 bit host system. With regards to the JDK version itself, I recommend using the latest stable version that is available from the relevant website. This ensures that you have all the latest bug fixes and supported features. I am trying above steps but "Standalone Application Settings... Window" memu option is disabled. yes, the "Standalone Application Settings..." option can be disabled. This is because they are specific to each stack. I am assuming that you do not have an open LiveCode stack. If you open an existing LiveCode stack or select "File -> New Mainstack", then you should be able to select the "Standalone Application Settings...". When trying to save to standalone Application, I always get error "could not compile application class"
This error occurs even from the download completed tutorial in you site. I've already installed the Java SDK, Android SDK, the google USB driver for tesing on the phone itself. However it just will not work. I'm currently in the trial period and can't even save a simple hello world application to run in android. Is there any way to get more details regarding the error so as to identify the problem. I had already installed the JDK 7u21, but in the section "Configuring LiveCode for Android Support" in JDK path say (none). what I need for configure the JDK with LiveCode in win7? I have only ASCII in field "identifier"
The standalone's are OK for MACOSX and WinXP. the fied ID content is "com.yourcompany.yourapp"
the JDK path is detected automatically once you have specified the SDK root. The SDK root can be set/selected from the path selection field under the label: "Location of Android development SDK root:"
you could also get the message if LiveCode does not find the Android SDK and you have not installed Android 2.2 API level 8. Check that you have followed the steps in sections: "Installing the Android SDK Packages" and "Configuring LiveCode for Android Support". Hope this addresses the problem you are having. I have a Windows 8 laptop and whenever I try to open the SDK Manager for Android, it opens on a small black screen and closes instantly. Therfore, I cannot install the required packages? Can you suggest a way for me to make it work? Hello, I could test my application in my Android tablet. How can I force the Android device to show a numeric keyboard to input numeric data into text entry fields? You can use the mobileSetKeyboardType command to specify that you want to show a numeric keyboard the next time the keyboard is displayed. Am using Ubuntu 13.04. Have installed Livecode community edition. Am unable to set the JDK path and Android development SDK root. When I try to set the Android SDK path, I get an error message THE CHOSEN FOLDER IS NOT A VALID ANDROID SDK. PLEASE ENSURE YOU HAVE INSTALLED IT CORRECTLY, AND ENABLED SUPPORT FOR ANDROID 2.2 (FROYO). When I try to set the location of the JDK path, I get the error message THE CHOSEN FOLDER IS NOT A VALID JDK. PLEASE ENSURE YOU HAVE INSTALLED IT CORRECTLY. Please guide me on setting up the JDK and Android SDK paths. Under step "Installing the Android SDK" you specify where the SDK is to be installed on your system. That is the SDK root. You need that path when configuring LiveCode for Android Support. That path can be different on your system, depending on where you install the SDK. You don' have to worry about the JDK Path. That gets populated automatically once you have set the path to the Android SDK. Before a few days I replied to your answer but strangely my reply was never added to this topic and I remarked this only now, so I waited for about a week for nothing... Anyway I have to write my comment again now. So, first of all, I thank you for your answer. But now about the Paths. My main problem is that I can't find the correct path... Maybe I installed the Android SDK incorrect? So, LiveCode alwasy tells me, when I choose a folder: "The chosen folder is not a valid Android SDK. Please ensure you have installed it correctly, and enabled support for Android 2.2 (Froyo)." By the way, how do I know that I enabled support for Android 2.2? got a bit back logged. Sorry. Looks like you have two issues here. Let us see if we can address them. If you have found the folder that contains these folders, then this is the one to include in LiveCode, but before you include it in LiveCode, make sure that you install Android 2.2. You can install Android 2.2 by navigating to tools in your favorite file browser and starting "./android". This should start the Android SDK Manager. In the interactive dialog, find "Android 2.2 (API 8), expand any sub items and select the tick boxes of the subitems on the left hand side that are not installed. That should install Android 2.2 for you. Hope this fixes it for you. That's strangely. I have the same problem than mine. This is a recurrent error. I traced the guide "How do I become a Android Developer on a PC" more than once. Into preferences, I selected Mobile Support and setup "Location of Android development SDK root" to my SDK folder. LiveCode accepted it. But JDK Path still empty. The recurrent error is: "There was an error while saving the standalone application could not compile application class". Someone really know what're we doing wrong? In my case, everything was working fine and I had my Mobile Support with the development tools installed in C:\Android SDK and it found the correct JDK when I set it 8 months ago. During this time I was able to generate .apk files and test using the Test option. Because the Emulators behavior were strange and not consistent, I followed the instructions to install the API 18 and the Revision 22 ( the r22 ) using the SDK Manager. After that, nothing work and I'm no longer able to generate files neither to test. I can launch any Emulator but still cannot use the Test option because I receive the error "Unknowing plattform - ". You said to Severin: "You don' have to worry about the JDK Path. That gets populated automatically once you have set the path to the Android SDK." That is the problem! If Livecode believes that the folder you navigate is not valid, you get the error message. In this Tutorial you say that Livecode does validate the folder informed to make sure that it is valid. Exactly, how does Livecode knows that it is valid or not? Is Livecode searching the Windows registry? If yes, which key is it trying to find ? I know that the API 18 upgrade did the mess, not Livecode. But why Livecode just simple allows developers to put the path the the Java Development Kit (JDK) instead of trying to find it automatically? Anyways, I already uninstalled all the Android and Java versions and reinstalled, having the same problem. So, do you know where and what information Livecode is trying to find to validate the folder informed? I had the same issue. Advise from Neil sorted it out. This work for me for Windows 8. Android section of LiveCodes mobile support preferences. mobGUI. Downloaded on Windows 8. Under my documents I have placed a My LiveCode folder, added Plugins to this folder. Activated mobGui with the Key provided as per summer school. Cannot see mobGUI as a plugin from LC blue. Any hints?? I'm having the same issues as "Jay" using Windows 7. I have installed and uninstalled every thing at least four time over the last 24 hours. I have had it running using 5.5.3, 5.5.4 and 5.5.5. but its not running in 5.5.5 any more. Also I tried the free version and it seems to work fine but won't and it detects the JDK and SDK but won't run a test. I would just be happy if I can get my 5.5.5 working again. it looks like you have all been having varying degrees of issues with the Android set up for Windows or Linux. Be this that you are new to LiveCode or that you have had Android working but it is not working now. This is obviously not ideal. This video shows the installation on a Mac, but the variations for Windows and Linux are pointed out. This video is in addition to the lesson here. I hope this video helps you address the issues you are having. Great tutorial, all the needed info is there! Remember to install Android 4.0.3 (API 15) from the SDK Manager first. The above is not correct, unless you have an older SDK package installed. In the new SDK download there is no longer an GUI for AVD or SDK manager. There is also no exe for both. Only command line. So if you want no Android Studio but you want an emulator try to get an older SDK install somewhere. I don't know how to start the emulator separate with Android Studio installed. 2. Choose "Start a new Android Studio Project"
there, choose Tools -> Android -> AVD Manager. "! ", you should be able to launch the emulator you just created.